Increased scrutiny on the part of the general public, media, and government has warranted a reexamination of corporate responsibilities, standards of accountability, the company's role in its local and extended community, and its ethical position in our society and culture. 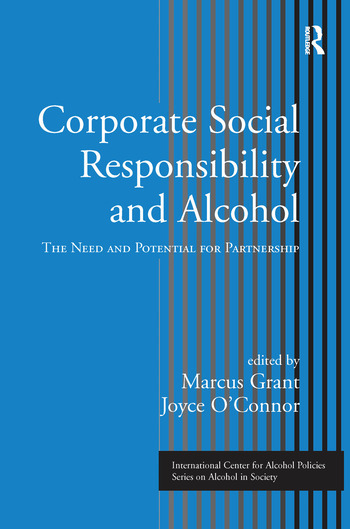 Corporate Social Responsibility and Alcohol considers the basic values, ethics, policies and practices of a company's business. Particular attention will be paid to the alcohol beverage industry, and the many unique issues that are specific to this business, such as: responsible marketing, promotional, and advertising campaigns and strategies; the particular risks inherent in any alcoholic product; issues of abuse prevention & education; research; and legal and ethical aspects of alcohol. This will be the seventh volume in the ICAP Series on Alcohol in Society. Grant, O'Connor, Introduction. Logan, O'Connor, Corporate Social Responsibility and Corporate Citizenship: Definitions, History and Issues. Orley, Corporate Social Responsibility and Product Safety: A Role for Public-private Partnership. Orley, Logan, Perspectives on Partnerships for Corporate Social Responsibility in the Beverage Alcohol Industry. Grant, Alcohol Policy Through Partnership: Is the Glass Half-empty or Half-full? Peele, Drinking Education: Minimizing Negatives or Optimizing Potential? Riley, Drinking it in: Findings of the Valencia Meeting on Marketing and Promotion of Alcohol to Young People. McAvoy, Mackenzie, Government Regulation, Corporate Responsibility and Personal Pleasure: A Public Health Perspective from New Zealand. Coors, Corporate Social Responsibility: A Context for Alcohol Policy. Orley, Corporate Social Responsibility in Practice Within the Beverage Alcohol Industry. Roche, Establishing Good Practice in Responsible Drinks Promotion: Illustrations of Good and Bad Practice from a Public Health Perspective. Burkitt, Are Alcohol Advertisers Drinking in the Last Chance Saloon? Britton, Setting the Standards for Responsible Consumer Marketing in Beverage Alcohol. Cressy, Gourovitch, Developing Solutions for Abusive Drinking on Campus: A Campus-Community-Industry Collaborative Model. Morgan, Approaches to Primary Prevention of Alcohol Misuse Among Young People. Houghton, Pedlow, Botha, Report on the Framework for Responsibility. Hannum, Conclusions.